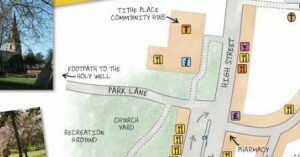 The proposed Southam Visitor Information Point at the Tithe Place Community Hub will carry a wide range of guides, maps and local attraction leaflets. In the meantime, most of these leaflets are currently available from Southam Library. Southam Visitor Guide & Map – Funded by Warwickshire County Council, and produced with lots of practical support from Stratford-on-Avon District Council, this new leaflet has a town centre map showing places to park, eat & drink, and lots of useful suggestions for things you might like to see and do in the Southam area. Southam Holy Well Walk – This circular walk takes you through the picturesque Stowe Valley to the Holy Well, then continues over the river, through the Stoneythorpe estate along ancient paths and back to the town. Southam Town Trail – The town is full of history and this Trail takes you to visit some of the most interesting places, but look out for what else there is to see along the way. Southam Heritage Trail – A gentle walk around Southam to see places of historical and modern interest. Walk the Trina Trail – This walk is dedicated to Southam dart player, Trina Gulliver, and marks her achievements in World Darts. Benches along the route record Trina’s championship victories. The walk starts at the Bowling Green Pub. Taking their name from a prominent aspect of the local geology, these nine circular walks are between five and thirteen miles (eight and twenty kilometres) long. Audio Walking Tour of Southam – Play on the web site or download the MP3 file to use as you walk. Church2Church Walks in South Warwickshire – A Series of 53 consecutive Church2Church Walks that will take you on a 156 mile journey all the way around South Warwickshire and to some of the most beautiful areas of the county. Long Itchington Walks – A collection of walks around the village.